Our in-house capability to form dished ends by either pressing or spinning brings major benefits to our customers and sets us apart from other dished end manufacturers. Each method can offer particular advantages when manufacturing the customer's product, and as we offer both options, we are able to decide at the enquiry stage which will be the best commercially for our customers. 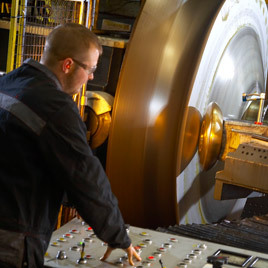 Spinning is the fastest of the two processes of forming, but is also the process which thins the material more. Pressing can be used on any radius of dished end, and brings extra benefits as it can be carried out to the exact mm required. Dished ends are not thinned as much through pressing. Choosing the right forming process is a key decision for each customer, and one for which our experienced team are happy to give advice. In simple terms. The shallower the end, the less pressure it can withstand. Conversely, the deeper an end, the greater pressure it can take. See our section on quality control for the extra levels of service we provide to ensure your dished end is of the highest standard of production and suitability. Hemispheres formed using this technique are fully spun and are a profiled plate circle when started, then spun over a tool which has the exact spherical shape. This allows the end to be formed entirely on one spinning machine. 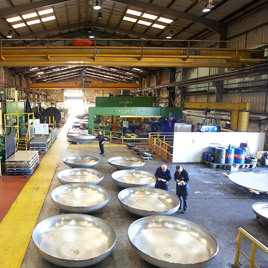 We have a wide range of tools which can produce single piece hemispheres up to 2m diameter. These are some of the largest tool sets for Hemispheres in the UK. 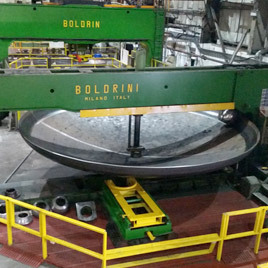 A contract specific spherical radius is formed using one of our three specialist Boldrini hydraulic presses. Following this, the required knuckle radius is spun using one of our six Boldrini flanging units. This process allows us to form much thicker dished ends, as from 5mm and above we are able to press them. The spherical radius is variable to whatever the client requires. 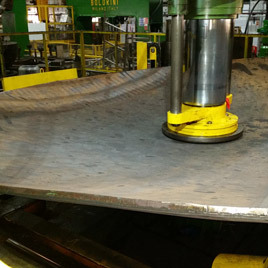 We are able to press at tailored sizes for clients through press and flanging, so if the specific sizes are not on our guide charts, please call our team for advice. Unlike pressing, the spherical radius is formed by spinning the plate blank against a fixed forming tool on one of our four Liefeld spinning lathes. Forming of the knuckle radius is made in the same way as pressed ends.